What does Julie think is funny? One of the many challenges of collaborative writing is that Maggie and I often don't find the same things funny. Often if I'm watching a sitcom and hanging out online I'll quote a line to Maggie and she won't find it funny at all. So here are three things I think are hilarious and Maggie's reaction. So here are the newlyweds sharing breakfast (and then their hijinks after). Everything about this first scene cracks me up, starting with the marbles. I love people acting ridiculous when it actually makes sense with the characterization. In this case, April and Andy are absolutely goofball characters, while Ben, their roommate, plays the straight man. Mostly it's the Frisbees, though. Maggie: Well, I didn’t find April and Andy funny at all. In fact, my opinion of them plummeted to the floor because they seem to think it is awesome to cheat people out of money. I did chuckle at the laundry bit and the marshmallow shooting. Poor Ben needs to be around better people. I like comics and Maggie's not so into them. Bartholomew's debut is one of my favorite comics ever, though. "Ow! You are stinging me." Reginald's art skills are horrible and the entire premise of his comic (and even the reason for drawing his comic) is ludicrous. Beartato (the round guy) has an expression in the final panel that is just priceless. Maggie: Now I find a great deal of Nedroid funny. I chuckled at the last two. The first one I just don’t really see why it is funny but that is my brain being too literal. The embedded version may or may not work--if it doesn't, try http://www.latenightwithjimmyfallon.com/7th-floor-west/video/episode-4-that-is-so-not-ok/1127722/ (and reload as needed). Skip ahead to about 1:05...because one thing Maggie and I have in common is we don't think bodily function jokes are funny. I don't even know how many times I've seen this and I still laugh every time. The sheer lunacy of the dance, coupled with Lauren the assistant's deadpan/cold looks…plus pizza is already kind of funny. The clip with just the dance was taken off YouTube but I used to post it on my Facebook every time I ate pizza. I was devastated when I saw the clip was off of YouTube, fearing this work of comedy was lost from the Internet forever. There’s a common thread in what I think is funny--all these rely on complete absurdism, and more often than not there is a voice of reason in the lunacy. Actually, in real life, Maggie often is that voice of reason giving me that cold Lauren-ish stare (all the way from Florida). Given my taste in comedy...that might be fair. Next week we’ll find what Maggie thinks is funny! First, if you didn't see my edit yesterday, great news! Matt Mikalatos posted his funny monster guide from Night of the Living Dead Christian on his blog (link in the first paragraph of his post). I suggest you read it. If you like it, look into that book. Moving on! This review is by Julie, so no hate mail for Maggie on this, please. Thanks for your consideration. 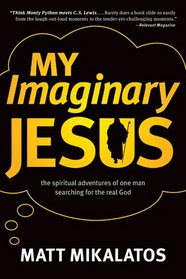 Ridiculously simplified summary: The author realizes the Jesus he believes is real is really just a convenient Jesus he's imagined. On a quest to find the real Jesus, Matt meets countless other imagined Jesuses. Hijinks ensue, with characters like Simon Peter and a talking donkey. So yeah, when my co-author and I started this review system early this year, we made a special point to say we wouldn't rate based on religious content per se, because something that touches one person might bore another, and so on. Of course, this Jesus is the Jesus that Matt (Matt as the character, as distinct from Matt Mikalatos as the author) made up in his mind. It's not the real Jesus. The whole idea that we all envision Jesus wrong is an important one and the point is made in a memorable way. But how to rate it? I counted the name "Jesus" (or "Jesuses") 17 times over 2 pages. Page for page, this book says "Jesus" (or some variation thereof) way more than the New Testament. (Well, unless maybe your Bible has really tiny print.) So I can't really rate the book without taking the Christian content into account. And how can I not rate based on my reaction to the irreverent treatment and portrayal of characters referred to as "Jesus"? The whole book has scenes like the above fight. Jesus after Jesus appears, and they do wacky things like racing down a hill in an inner tube while having a religious argument. Among the many false Jesuses are Feminist Jesus, Portland Jesus, Political Power Jesus, King James Jesus, and the popular Magic 8 Ball Jesus (which I'll admit hits the closest to home for me). Humor lets an author get into places he or she might otherwise never reach. At least one agnostic read and enjoyed "Imaginary Jesus" (though it didn't bring him back to Christianity). But a disadvantage of using humor is that if the reader isn't smiling, he or she is probably getting annoyed. Or offended. Most the other reviews I saw were glowingly positive, though it appears the vast majority of those positive reviews were also from people who found the book hilarious. It sounds like I'm in the distinct minority, but I just don't see any humor in (fake) Jesus literally cackling, "I'll get you, my pretty! And your little donkey, too!" And I think it's sad to see a fake Jesus trying to win Matt back like the proverbial mop in the Swiffer commercial. "Let's be frank, Matt. The real Jesus is inconvenient. He doesn't always show up when you call. He asks for unreasonable things. He frightens people. He can be immensely frustrating. But you can still serve him while working with an imaginary Jesus. We provide a service to get closer to God." But it was a challenge for me to get past the irreverence that permeated the book to focus on the message. I rated the review categories as best I could for the rating below, but I won't break them down here because they all pretty much came down to "If you found it hilarious, (insert category here) was probably good." Humor is so subjective and my rating system doesn't cover religious content, so the objective rating system which seemed like such a great idea yesterday has utterly failed me here. I thought the storyline was more cohesive in Mikalatos' follow-up book, Night of the Living Dead Christian, and unlike most reviewers, I found that one funnier, too. (I also liked "Matt" better there.) Looking forward to seeing his next project! Recommended for: People who enjoy the first few pages on Amazon. Maybe not so good for: Ultra-conservatives; active Mormons (being friends with several, I thought they were mocked pretty relentlessly); people expecting a fantasy or science-fiction world (I wouldn't call this speculative except in the VERY broadest sense of the word). Thanks for the tour, all! This is the first review tour I've done and I enjoyed it. What about you? Do you have any misconceptions about Jesus in your life? This is Julie again. I have a review system you may (or may not) want to look at to see HOW I come up with my ratings and what I rate on. Ridiculously simplified summary: In the modern-day northwest US, a ragtag crew of misfits helps a werewolf overcome his dark inner nature through Christ. On the way, they learn to face the monsters in themselves. Content: I hadn't read Mikalatos' book My Imaginary Jesus before this one, though there are several references to the narrator being the author of that book. This is touted as a "ferociously funny quest to discover what it means to be fully transformed." Blogger Shane Werlinger described the book as "humorous," which is exactly the word I'd use. It made me smile in quite a few spots but only made me actually laugh a few times. As you'll see tomorrow, it's not terribly easy to make me laugh. Actually, I never read "The Hitchhiker's Guide to the Galaxy" but I remember my high school best friend would always quote lines from it and try to make me laugh. The only time it worked was when she said a line but substituted "Arby's" for a restaurant that wasn't local (the original line would not have made me laugh). Honestly, you can get enough reading the first few pages on Amazon to know how funny you'll find it. Characters: 7 out of 10. Again, a lot of the humor comes from characters acting stupid, which can make it a little hard for me to like them. (I think of Michael Scott on The Office; sometimes he's stupid-funny and sometimes he's just stupid.) Matt (the character, as distinguished from Mikalatos the author) was absolutely bumbling throughout, and a few of the characters weren't that well-defined, instead flexing to fit into whatever joke they were needed for. You could say the same about most sitcom characters, though, so fair enough. That said, Luther and Lara in particular were good characters, and the character TYPES who were lampooned (and in particular the churchgoing zombies) had a lot of truth to them. Writing/editing: 8 out of 10. I only noticed a couple continuity errors (I believe there is one on Amazon's preview, with the flashlight getting dropped, then soon after, being gripped tightly). If there were other issues later on, I missed them because I was caught up in the story. As in almost all comedies, sometimes the jokes trump the storyline. Some of the jokes were notably stupid/bad....but if that notably stupid/bad joke makes you smile (or in at least one case, laugh out loud), does that make it a good joke? Yeah, probably. To me, the ending read almost like a modern short story, where the whole world changes profoundly. That isn't my favorite thing, but others might love it. Fortunately, the bonus content at the end of the book (which I touched on yesterday) brought back the light tone I'd missed from the beginning of the book. Plausibility/believability: 3 out of 5. Yeah, this is an almost useless category for a book full of zombies. Still, I basically bought the world as it was, even when the characters were acting fairly insane. What I really struggled with was that the narrator (Matt) portrays himself as generally silly/stupid/inept throughout the book. (His werewolf friend briefly assumes that Matt has some sort of spiritual knowledge based on his book Imaginary Jesus, which I'll touch on tomorrow.) Yet at the end, Matt is the one giving lectures on Christianity. There are hints of his spirituality throughout the book, but I just couldn't believe this same character who refers to his Toyota Corolla as his "Secret Lair" would attend, much less enjoy, a classical music concert and use it as a metaphor for Christianity. I am almost certain Mikalatos the author can be both silly and serious, probably exactly as outlined above. But fiction, oddly, has to be more believable than real life. I think the challenge comes from the book relying on Matt's silliness for the humor, and then relying on Matt to deliver the spiritual message, when he wasn't even the character who changed in this book. I'm not certain there would be any way to write that better, though....if Matt had been serious throughout, I don't think I would have enjoyed the book. Positive: 4 out of 5. There isn't a perfectly happy ending, and I don't feel like the book answered all the questions brought up about Christianity. But overall it shows that Christ can overcome all things. Gut reaction: 3 out of 5. It was LOTS of fun to read a Christian book with werewolves and vampires. I love when books make me smile and this one did. It was a good read. Recommended for: Fans of comics/monsters coupled with extreme silliness. 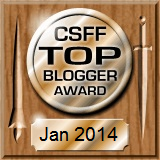 I'm part of the CSFF Blog tour this month! Pumpkin EVE is also a robot made out of organic matter. 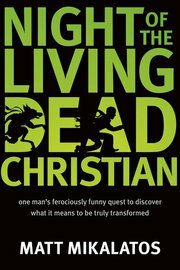 The premise of Night of the Living Dead Christian by Matt Mikalatos is that many so-called Christians are, at their heart, monsters in need of Christ's transformation. Written in first-person, Matt plays the bumbling narrator, while the change character is a Lutheran werewolf (and his father named him Luther Martin--Luther Anne Martin!) who insists he's not a Christian. The werewolf has anger issues; the vampire feeds off others for selfish gain; the zombies follow a pastor blindly, and so forth. Per the guide, weaknesses of robots include "inability to tell when they have hurt someone's feelings, lack of awareness of their own emotions, social awkwardness and/or relational immaturity." Natural enemies include "Rust, water, illogic, sentimentality, Dr. Phil." Thank you for informing me that you love me. I will carefully consider a proper response and get back to you in a period of no more than fourteen days. I've got to say, some of the diagnoses seem a bit odd to me. Mikalatos decided vampires don't like to look at themselves (as opposed to being unable to see themselves)...but some people I know who I would class as having vampiric qualities--at least the women--love looking at themselves. While some of the least vampiric women I know (and even a robot such as myself) don't like looking in the mirror! I'm not sure he understands the inherent insecurity almost all women have with their appearance...vampire or not. Ah well. Interesting to think about. So yeah, I'm a robot. What B-movie monster type do you most identify with? EDITED to add: Matt posted this funny monster guide on his blog (link in the first paragraph of his post). I think it's worth reading, though probably more useful if you've read the book. Here are the other participants in the CSFF Blog Tour. They are all writing entries on Night of the Living Dead Christian between today and Wednesday. Check them out! This is Maggie. On occasion, we come across a scene or a sentence that refuses to cooperate. No matter how much we try, we can’t make it work. These giant boulders of writers’ block are so big, we can’t see around them. Any attempt to clear the path causes more boulders to appear that leads to an avalanche of misery. Julie: Or at least several hours of clearing away pebbles. I take this as a sign that the idea we’re trying to shove is not meant to be shoved. What’s the solution? Maggie’s Rule. Maggie’s Rule is when one of us suggests to cut a line, a paragraph or an idea because it refuses to cooperate. Because let’s face it, not every idea that is ever written is golden and there are reasons why it won’t be shaped and molded into the thing we were wanting it to be. Julie: Or if you’re wishy-washy like I am, “When in doubt, take it out.” You’d be surprised how deleting a stubborn word or sentence can make your story that much stronger. We call it “MR” for short and really it is just a time saver. No need to explain what we think should happen to this line, paragraph or idea. Just “MR” it! Julie: It’s called “Maggie’s Rule” because Maggie’s the one who deletes things more easily. I don’t mind making changes, but I like to keep things around, just in case we might go back to them later. The converse of Maggie’s Rule is Julie’s Rule. I think that “For a while” up there is redundant. Can we MR it? Julie again. If you want to publish on Kindle, Nook, Smashwords, Lulu, or any other platform, there is no perfect way to include your co-author. Some of them have problems with giving both authors credit. All of them can only send the money to one person (or bank account). We decided that I'd handle the publishing for Book 1. I think we had some sort of idea that Maggie publish Book 2 so the money would even out. Belatedly, we realized that probably isn't the best plan, because on most sites you don't get paid until you get $10 (or sometimes more) in royalties. On Barnes and Noble's "Pubit" site, you have to input a "primary contributor." 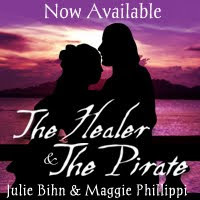 That may be why the title of our Barnes and Noble page says it's by Julie Bihn, Julie Bihn, and Maggie Phillippi. You can at least choose multiple authors, which we did. On Amazon, you can also choose multiple authors, though at least on the Kindle Direct Publishing page, it still insists I'm the author. I didn't notice any major glitches. 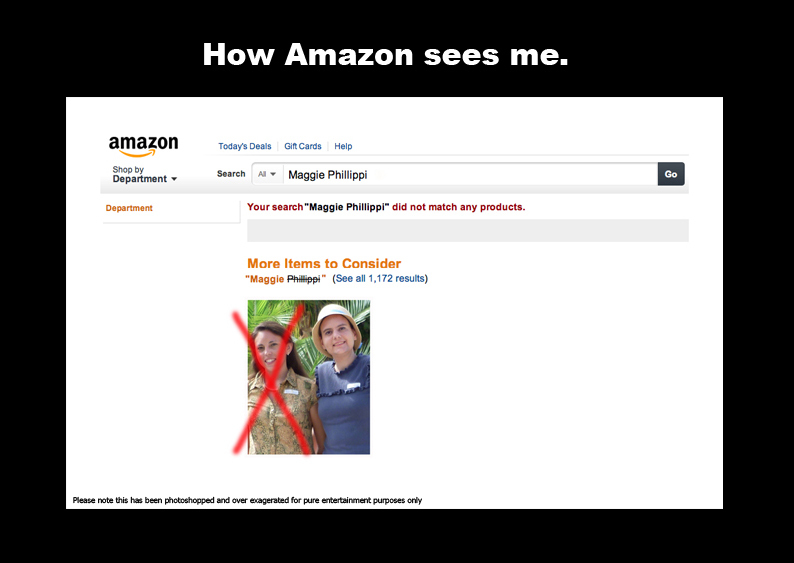 Maggie: Hey that’s OK Amazon (and other epub places). Leave me behind, stranded on my own like a widow line all by itself on the next page. I’ll just sit over here and make pictures to show my frustration. I’m not recognized on the Kindlegraph either. But Julie can sign autographs. Which she would get a kick out of it you requested one! In fairness, Kindlegraph at least claimed they were working on the co-author thing....though that was months ago if I recall correctly. For the next book, Maggie can sign up to give Kindlegraphs. And for Book 2, what I plan to do is make Maggie the “primary contributor” on Barnes and Noble and list her name first on the author screen on Amazon. Since I listed myself first for Book 1, it will even out that way. Maggie: Though beware, I’m fairy certain I found our book pirated. Probably had something to do with Smashwords, since Smashwords allows you to download a PDF right to your computer. To publish on several other sites, like Sony and Apple, you need to have an ISBN. You can get one free on Smashwords, and they will publish your book to these sites for you. Which is great…except there doesn't appear to be a way to have the ISBN registered to multiple authors. Argh! For print copies, I don't recall having any problems with displaying co-authors on Lulu or Amazon's CreateSpace. One place that was GREAT for co-authors was the US Copyright website. I had no problem registering myself and Maggie as the authors. Who would've thought? Maggie: Confuses me, that’s for sure. There are so many people out there that write with co-authors. It’s crazy provisions haven’t been made so that both authors get treated equally. Judith Miller must be ready to wring necks! 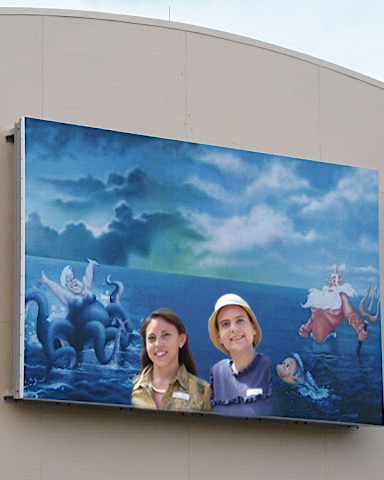 (She writes with Tracie Peterson.) No, I’m just kidding. It’s more important that the book is out there, and hopefully being enjoyed by readers, and not whose name comes first. My solution is to make sure we write multiple books so that each of our names can alternate being FIRST, at least on Amazon and Barnes and Noble. So let's get to writing, Maggie! This is Julie here. A huge part of writing is rewriting. You might think that if two people write the book together, they'd catch all the problems and there would be nothing to edit! Maggie: Oh how I wish that were true. There are some great advantages when editing a co-written work, but some disadvantages too. For instance, if someone wants to change something--ANYTHING--Maggie and I have to agree. That can be good (I love editing and could make changes forever, even when they're not needed or helpful). But sometimes it's hard to come to an agreement. And feelings can get hurt sometimes. One bit of advice I heard is to keep in mind it’s about the story, and whatever makes the story stronger. I try to remember that. Stage 1. 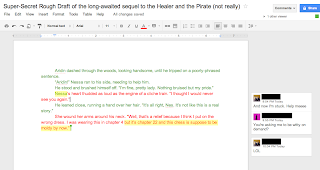 Editing while writing. 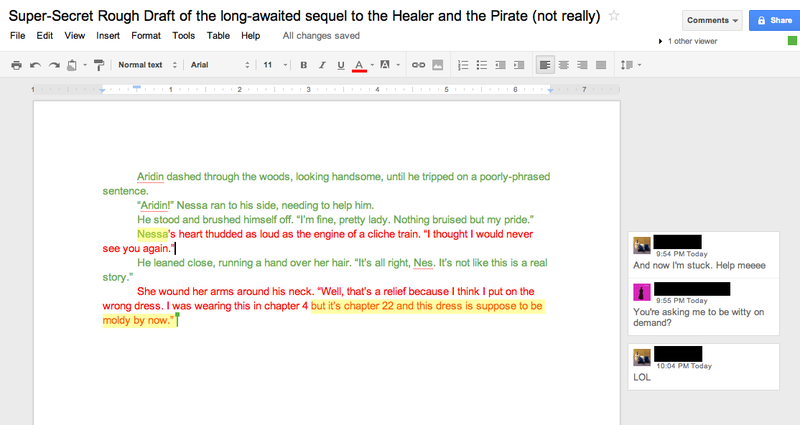 Some people say you should never edit while you’re writing a book, but let the ideas flow and then edit later. With a co-author, unless you love everything they type (and I don't even love everything I type! ), it’s almost impossible not to at least make little changes. Macro changes, such as plot threads that go awry, really need to be dealt with before you move on to the rest of the book. Otherwise it's a domino effect and you could end up throwing out entire chapters later on. A great thing here is to get a list of your overused words and kill them when possible. The find function works wonders. Stage 3. Once it’s polished enough, send to a critique group or beta reader. At the very least, even a co-written work needs a second set of eyes. Or third, or fourth. I don't care how many authors wrote it; you're all too close to see plot issues. You know your characters and storyline too well to know where it's confusing. So at the least, find SOMEONE. Maggie: Someone that isn’t related to you or you’ve known since preschool. Stage 4. Once it's through the critique and/or beta reader process, go through again and incorporate suggestions as you see fit. Stage 5. Wait a couple weeks before another look through. You can hire an editor, grab another beta reader, or just load the book onto your Kindle (or print a copy, or change the font) and look through one more time. Again, if you’re like me, you could edit forever, so it’s good to have a voice telling you to just stop already.